The ENERGY STAR Most Efficient 2019 designation recognizes the most efficient products among those that are ENERGY STAR certified. These exceptional furnaces represent the leading edge in energy efficient products this year. These furnaces are designed to provide the best comfort for the least energy with the associated thermostat, controller, or application identified below, and EPA recommends that they are installed as such. Access the full list of products recognized as ENERGY STAR Most Efficient in Excel. The AirEase - Pro Series A97mv furnace advance engineering delivers year round performance, with utility saving you’ll see very month. Featuring a modulating heating system with a variable-speed fan, the A97mv with Comfort Sync® efficiently adjusts heating output as the external temperature changes throughout the day - insuring consistently precise temperature control throughout your home. The a97mv has an AFUE of up to 97%, meaning it coverts a full 97% of your fuel into usable heat. That means you can keep your home warm and cozy, while still remaining energy-efficient, all winter long. Every piece of AirEase’s Pro Series equipment means control, precision and efficiency. Temperature. Humidity. Air quality. With the Pro Series, you’re in control of every aspect of your home’s climate, as well as your energy costs. Enjoy sophisticated system management, unprecedented control and exceptional energy savings with a Comfort Sync thermostat. Featuring self-configuring control, Airquest® VC 97 furnaces are built with stainless steel primary and secondary heat exchangers and achieve 97% AFUE. The modulating (multi-stage) gas valves allow the furnace to operate on a quieter low-fire setting unless thermostat calls for more fire. Airquest® control recommended for full functionality. The Observer® communicating wall control offers Wi-Fi® capability for remote access, and is capable of controlling up to six zones in your home and customization of temperatures seven days a week. Featuring self-configuring control, Arcoaire® VC 97 furnaces are built with stainless steel primary and secondary heat exchangers and achieve 97% AFUE. The modulating (multi-stage) gas valves allow the Arcoaire® VC 97 to operate on a quieter low-fire setting unless thermostat calls for more fire. Arcoaire® control recommended for full functionality. The Armstrong Air - Pro Series A97mv furnace advance engineering delivers year round performance, with utility saving you’ll see very month. Featuring a modulating heating system with a variable-speed fan, the A97mv with Comfort Sync® efficiently adjusts heating output as the external temperature changes throughout the day - insuring consistently precise temperature control throughout your home. The a97mv has an AFUE of up to 97%, meaning it coverts a full 97% of your fuel into usable heat. That means you can keep your home warm and cozy, while still remaining energy-efficient, all winter long. Every piece of Armstrong Air’s Pro Series equipment means control, precision and efficiency. Temperature. Humidity. Air quality. With the Pro Series, you’re in control of every aspect of your home’s climate, as well as your energy costs. The Evolution® System 987M furnace has a new modulating gas valve that matches heating output to the home's heating needs to provide precise heating power for maximum comfort. True multi-position design allows upflow, downflow or horizontal installation with up to 98.3% AFUE performance in all configurations. Evolution® control recommended for full functionality. Designed with an intuitive interface, Wi-Fi, occupancy and built-in smarts, putting you in control of your comfort and energy savings. 59MN7 Infinity® 98 Furnace with Greenspeed™ Intelligence achieves AFUE of up to 98.5%. Greenspeed™ intelligence adjusts modulating gas valve output from 40% to 100% of capacity in one-percentage-point increments for precise comfort. Variable-speed ECM blower and inducer motors operate at quieter, lower speeds. Infinity® control recommended for full functionality. The Infinity Touch control is the key to unlocking your comfort potential. This one control can manage temperatures, humidity, ventilation, airflow, indoor air quality and up to eight zones. The Daikin DM97MC and DC97MC are high-efficiency modulating furnaces with a variable-speed airflow system, and can reach up to 98% AFUE heating performance. New, digitally programmable thermostats, such as a ComfortNetTM Thermostat, feature both comfort and efficiency-enhancing functionality with their smart technology and remote access. Featuring self-configuring control, Constant Comfort® VC 97 furnaces are built with stainless steel primary and secondary heat exchangers and achieve 97% AFUE. The modulating (multi-stage) gas valves allow the furnace to operate on a quieter low-fire setting unless thermostat calls for more fire. Day & Night® control recommended for full functionality. Featuring self-configuring control, SoftSound® VC 97 furnaces are built with stainless steel primary and secondary heat exchangers and achieve 97% AFUE. The modulating (multi-stage) gas valves allow the furnace to operate on a quieter low-fire setting unless thermostat calls for more fire. ComfortMaker® control recommended for full functionality. Featuring self-configuring control, QuietComfort® VC 97 furnaces are built with stainless steel primary and secondary heat exchangers and achieve 97% AFUE. The modulating (multi-stage) gas valves allow the furnace to operate on a quieter low-fire setting unless thermostat calls for more fire. Heil® control recommended for full functionality. Featuring self-configuring control, ICP Commercial® VC 97 furnaces are built with stainless steel primary and secondary heat exchangers and achieve 97% AFUE. The modulating (multi-stage) gas valves allow the ICP Commercial® VC 97 to operate on a quieter low-fire setting unless thermostat calls for more fire. ICP Commercial® control recommended for full functionality. Featuring self-configuring control, Keeprite® VC 97 furnaces are built with stainless steel primary and secondary heat exchangers and achieve 97% AFUE. The modulating (multi-stage) gas valves allow the furnace to operate on a quieter low-fire setting unless thermostat calls for more fire. Keeprite® control recommended for full functionality. Featuring self-configuring control, Kenmore® VC 97 furnaces are built with stainless steel primary and secondary heat exchangers and achieve 97% AFUE. The modulating (multi-stage) gas valves allow the Kenmore® VC 97 to operate on a quieter low-fire setting unless thermostat calls for more fire. Kenmore® control recommended for full functionality. The Lennox SL297NV ultra-low NOx gas furnace with our revolutionary design provides reliable comfort, while producing 65% lower NOx emissions than standard low NOx furnaces. So, while you’re staying cozy and warm, you’re also helping to protect the environment. The iComfort® S30 ultra smart thermostat is the ultimate controller for precise comfort, convenience, and energy savings you deserve. 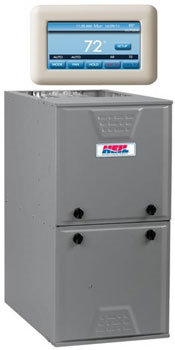 The Dave Lennox Signature SLP98V gas furnace features efficiencies up to 98.7% AFUE. Modulating gas heat and variable speed blower provide precise comfort, quiet operating sounds, and high energy savings. Fully communicating controls offer advanced diagnostics to exchange system information and to ensure optimal performance and efficiency. To view compatible central air conditioners and air-source heat pumps models, see the ENERGY STAR Most Efficient CAC-ASHPs page. Lennox’s iComfort S30 Ultra-Smart thermostat delivers on the highest standards of energy savings, comfort, convenience, and system connectivity when paired with Lennox’s ENERGY STAR Most Efficient iComfort enabled communicating equipment. Prestige® R97V furnaces feature a modulating gas valve from 40% to 100% of capacity and variable speed blower provide the ultimate in comfort, quiet operation and energy savings. Fully communicating EcoNet control provides advanced diagnostics and system information to ensure optimal performance and efficiency. EcoNet® control recommended for full functionality. The EcoNet Control Center automatically configures communicating equipment with optimal settings, adapts to your décor through interchangeable faceplates and adjustable background coloring, and features a full-color, 4.7" LCD touchscreen display with easy-to-read icons and text. Prestige® R98V furnaces feature a modulating gas valve from 40% to 100% of capacity and variable speed blower to provide the ultimate in comfort, quiet operation and energy savings. Fully communicating EcoNet control provides advanced diagnostics and system information to ensure optimal performance and efficiency. The EcoNet Control Center automatically configures communicating equipment with optimal settings, adapts to your décor through interchangeable faceplates and adjustable background coloring, and features a full- color, 4.7" LCD touchscreen display with easy-to-read icons and text. Ultra® U97V furnaces feature a modulating gas valve from 40% to 100% of capacity and variable speed blower provide the ultimate in comfort, quiet operation and energy savings. Fully communicating EcoNet control provides advanced diagnostics and system information to ensure optimal performance and efficiency. Ultra® U98V furnaces feature a modulating gas valve from 40% to 100% of capacity and variable speed blower to provide the ultimate in comfort, quiet operation and energy savings. Fully communicating EcoNet control provides advanced diagnostics and system information to ensure optimal performance and efficiency. Featuring self-configuring control, SmartComfort® VC 97 furnaces are built with stainless steel primary and secondary heat exchangers and achieve 97% AFUE. The modulating (multi-stage) gas valves allow the SmartComfort® VC 97 to operate on a quieter low-fire setting unless thermostat calls for more fire. Tempstar® control recommended for full functionality. *Estimated using an average price of electricity of 10.9 cents per kilowatt hour.